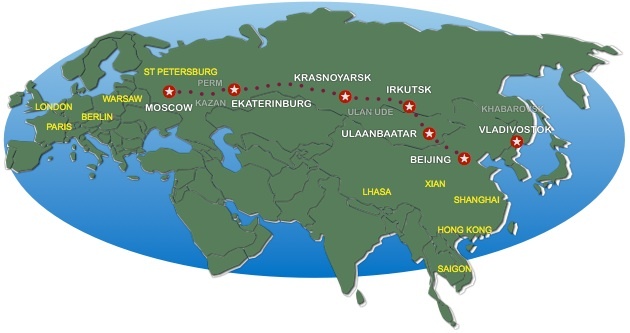 The Trans-Mongolian route is the shortest of the 3 train routes at 7,621km (4,735 miles) from Moscow to Beijing. It is also the most popular route by a long way as most people prefer to pass through or, even better, stop off in Mongolia. Scenically it is also the most varied. The Chinese operated train number 3 / 4 runs the entire route and takes just over 5 days. Two border crossings have to be made at the Russian / Mongolian border at Naushki / Sukhbaatar and the Mongolian / China border at Zamyn-Uud / Erenhot. * The cities marked in yellow on the map are just some which can be connected to by rail from this line. A Trans-Mongolian rail tour is very often the experience of a lifetime for our clients and we offer our fully tailored service so that you can make the most of the amazing opportunities this epic journey offers the traveller with a trip designed specifically with your particular requirements in mind. The tailor made Trans-Siberian holidays we design are not just for those on big budgets but for those who want a more individualized experience that matches their style of touring and budget and yet guarantee fantastic value. We design such trips for those with special interests such as literary or historical, honeymooners and school groups. However, the majority of tailored itineraries are made for clients who have fixed dates of travel or who wish to see destinations not covered by our standard trips. Why a bespoke Trans Mongolian rail tour with RailTourGuide? Draw on our Teams combined experience of almost 20 years arranging trans-Siberian railway trips. They have traveled to most destinations, often many times and taken all three train routes. Benefit from our unrivalled attention to every detail of your trip from your dedicated Trans-Siberian travel expert. We offer flexibility of arrangements to meet your specific needs, dates and style of travel and have the experience and resources to be able to use a wealth of different trains, hotel and stopover options. All trips offer peace of mind with full financial protection through our suppliers ABTA membership and ATOL license. or just complete the bespoke enquiry form below.